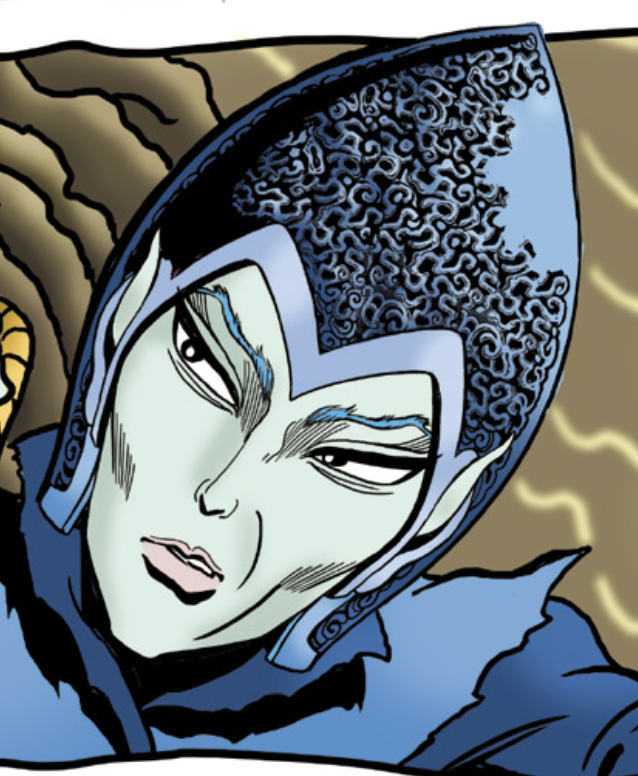 Ekolin is an ancient elf, originally a follower of Voll, and was one of the shapers of Blue Mountain. In the long ago days, he allied himself with Winnowill and helped shape her secret hidden chambers deep in the mountain. As Winnowill descended into stagnation and madness, Ekolin found himself, as all the Gliders eventually did, no longer a companion but a minion. For Ekolin, that meant existence in a semi-comatose state, awake and aware of events around him, but unable to move, perched above the stone portal leading to Winnowill’s private lair. His sole purpose was to use his rock-shaping magic to open and close that door, on her command. There he spent untold centuries as a silent witness as she toyed with her playthings, hatched plots, murdered her troll mate Smelt, and tortured her own son Two-Edge into madness. Even his name fell into disuse and he became known only as “Door,” nothing more than a reflection of his function and use to Winnowill. When Blue Mountain fell, the Wolfriders left Door in the care of the worshipful human tribe the Hoan G’tay Sho. The humans migrated and eventually settled in the tropical forest known as the Forevergreen. Centuries passed and the humans went from caretaking to manipulating the Glider to secure their own power. Door fled back inside his own mind, descending into madness. Eventually, Door again emerged from his somnolent state. He sent out an alluring vision which was sensed by the young mystic Sunstream. This led to an exploratory journey to the Forevergreen led by Dart. When Dart’s band found Door, the presence of elves after so long snapped the Glider fully awake and, like his former master Winnowill, he determined to dominate and be worshipped by both elves and humans. Door’s ambitions were thwarted by his Recognition to the Sun Villager Dodia, who knocked him comatose with a bash to the head. He eventually recovered and made it his mission to answer the great Call of the Palace of the High Ones. Unlike other elfin pilgrims, however, Door didn’t intend to join the elves and leave the planet to return to the Star Home. Instead, still desperate to dominate, his plan was to imprison the elves on the World of Two Moons; he would control all access to the Palace in exchange for worship. Though powerful himself, Door stood no chance against the overwhelming outpouring of light and love from the Palace Dwellers. Door’s layers of emotional decay and loneliness were sloughed away in an instant, leaving his true self – Ekolin – stripped bare. Finally accepting that freedom he, like most of the rest of the Gliders, chose at last to shed physical form and exist in the eternal bliss of spirit.